This is the first post in a two-part series written by Matthew Ardizzone, Eastman’s Associate Dean of Admissions and Enrollment Management. In my last post I wrote about the problems inherent in music school rankings (which are always subjective) and challenged prospective students to seek out what distinguishes each school, rather than rely on any ranked list. As a follow up, I thought it would make sense to address the question of what distinguishes Eastman among professional schools of music. 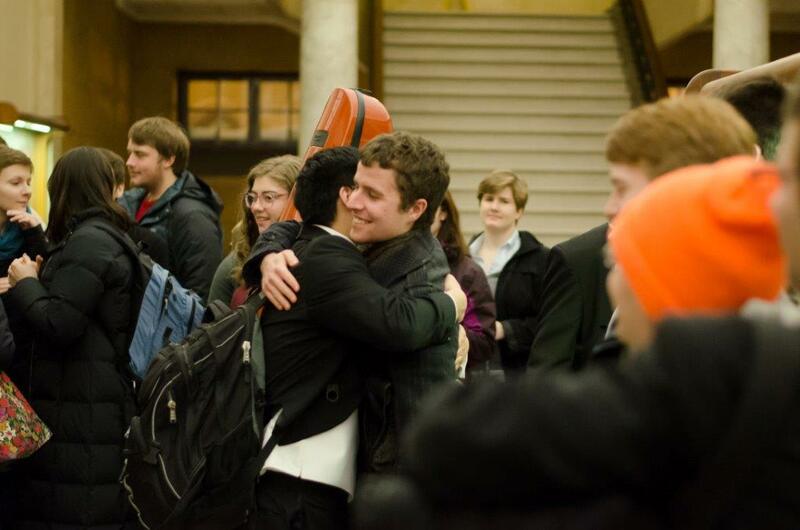 Eastman students support each other. The first thing that always comes to mind when I think about what makes Eastman such a special place is the nature of our students. Eastman students demonstrate a remarkable balance of ambition and caring. They are able to pursue their craft at the highest levels while maintaining a strong sense of community and a generosity of spirit that is made evident in many ways. A favorite and oft-recurring example is what happens after a concert by one of our ensembles, such as the Eastman Wind Ensemble, Eastman Philharmonia, or Musica Nova in Kodak Hall. The audience, made up largely of students, assembles outside the stage doors and cheers loudly as members of the ensemble exit the stage. It speaks volumes when highly ambitious students will forgo a little practice time in order to support their peers. Another striking thing about our students is that although they enter Eastman with a high level of accomplishment in their respective areas of study, they come in with a refreshingly broad vision of what it means to be a musician in the 21st century. We see it as our job to ensure they achieve the highest levels of musical preparation while they are here, but we also pride ourselves on our ability to ‘get out of their way’ to a certain degree, allowing and encouraging our students to pursue interests and skill sets outside of their major area of study. We have students pursuing coursework, or even minors or second degrees in all kinds of subject areas, including the humanities, sciences, engineering; popular areas include arts leadership, audio music engineering, digital media studies; we have performance majors studying conducting, double majors in music education and performance, jazz majors studying classical performance and vice versa. And we have more “conservatory-minded” students who, while focusing on their performance studies and taking only the minimum academic requirements, are still exposed to a comprehensive curriculum that deepens their musicianship and expands their worldview. In other words, our students enter and emerge from Eastman with a sense of the importance of a strong musical core, but also an understanding that versatility and creativity are qualities that will serve them well professionally. Eastman alumni are some of the most successful musicians today. There’s a lot more to say, but I’ll stop there for now. In Part Two, I’ll focus on the tradition of artistic excellence, comprehensive curriculum, and renowned facilities that contribute further to Eastman’s distinction in the field. *Examples of Eastman alumni include many, many hard-working music professionals, and attempting to keep track of them all becomes intensely overwhelming…which is a good problem to have! It inevitably becomes an exercise in leaving out large numbers of individuals who are doing great work in their respective communities. So the default is always to start with the fact they include many well-known artists like Renée Fleming, Ron Carter, Steve Gadd, Dominick Argento, Jeff Beal, Maria Schneider, Katherine Lewek, Nicole Cabell, Anthony Dean Griffey, Scott Healy, and Kevin Puts. They include members of our own faculty, and the faculty of major schools and universities including Yale University, Indiana University, Northwestern University, the Juilliard School, Rice University, Royal College of Music (London), University of Michigan, Oberlin Conservatory, New England Conservatory, Cleveland Institute of Music, Manhattan School of Music, Carnegie-Mellon University, Dartmouth College, the Peabody Institute of Music, Vanderbilt University, Interlochen Arts Academy, the Walnut Hill School, and many others. They perform in all of the top 10 American orchestras, in orchestras abroad, in US military bands, in their own ensembles, including Third Coast Percussion, Alarm Will Sound, JACK Quartet, Kneebody, Break of Reality, Signal, Respect Sextet and Colossus. They sing at the Metropolitan Opera, Paris Opera, LA Opera, Santa Fe Opera, Teatro Communale di Firenze, Teatro dell’Opera in Rome, the Houston Grand Opera, Washington National, San Francisco, Lyric and Cincinnati Operas. They lead in administrative positions at academic and performing arts organizations including the Boston Symphony Orchestra, Cleveland Orchestra, Metropolitan Opera, New World Symphony, Oberlin Conservatory, The Colburn School, Interlochen Arts Academy, NEC’s Entrepreneurial Musicianship program, University of the Arts, Northwestern’s Bienen School of Music, Rutgers University, Stetson University, Peck School of the Arts at the University of Wisconsin (Milwaukee), Westminster Choir College, and Eastman School of Music. And they create award-winning music, regularly earning the field’s most coveted prizes, such as the Pulitzer, Rome, and Barlow Prizes; ASCAP and BMI Awards, and Guggenheim, Fulbright, and DAAD Fellowships. Their work is performed by major orchestras, opera companies, soloists, and new music ensembles including the New York Philharmonic, London Symphony, Philadelphia, Minnesota, and National Symphony Orchestras; the San Francisco, Houston, Washington National and Minnesota Operas, and Ensemble Intercontemporain, eighth blackbird, Le Nouvel Ensemble Moderne, ICE, BroadBand, and Ensemble Signal.